Self-adhesive technology provider Herma is showcasing new wrap-around labeling system, 152E, at the upcoming Interpack 2017 event. At the event, which is scheduled to be held from 4-10 May in Germany, Herma will demonstrate 152E compact system’s ability to cover a wide range of product dimensions. The machine can also be equipped with the complete pharmaceutical equipment from the outset such as modules for variable data printing, for controlling printing and codes or for checking that labels are present and for the corresponding ejection. Herma said that the new 152E will be made available in two variants including one with a label application belt for high throughput as well as a roller prism for excellent precision. Herma Labelling Machines Division head Martin Kühl said: “Some users, such as pharmaceutical or cosmetic manufacturers, place great value on stable and efficient production processes. Short set-up times but also the perfect interplay of proven and optimally coordinated modules are important prerequisites in this respect. The 152E with label application belt is intended for short set-up times. It will have capacity to produce up to 100 products per minute. Additionally, the system with the roller prism provides higher precision and can handle around 90 products per minute. Herma noted that only a few format sets are required to be replaced when changing the product dimensions. 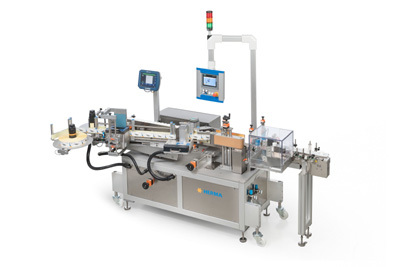 Image: Herma’s new compact 152E wrap-around labeling system. Photo: courtesy of Herma.